This crystaline forest scene features a curious fawn peeking out from behind a lush pine tree. Like a glittering ice sculpture, Vawn and Mike Gray's crystalline forest scene features a curious fawn peeking out from behind a lush pine tree. What appear to be shimmering bits of ice are actually pools of lustrous glass from bottles diverted from the waste stream to create functional works of art. The artists transform the colorful glass shards by arranging and melting the molten glass pieces into stunning mosaics that depict familiar sights from the land, sea and sky. 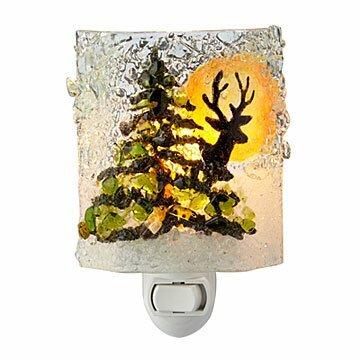 In this nightlight, a wintry woodland scene adds a charmingly rustic touch in any space, and after dark it illuminates rooms with soft, ambient light. Handmade in Cape Coral, Florida. Fun use of recycled glass. Have watched this company for years. Delighted to purchase one of their products. The design is excellent! I am very pleased and considering purchasing additional designs. Colored chunks of glass and thick glass backing gives just the right amount of illumination without distorting scene. Using for guest room. Appears sturdy and well made. Was packed with lots of cushioning and arrived undamaged. Great night light - fits my dÃ©cor and provides adequate light at night. This was a Christmas gift for my brother who enjoys the hunt of the big buck. He loved it! I ordered a Pelican years ago and was very impressed with the quality and beauty of this nightlight. They are very attractive, even if you don't turn them on. And when you do turn them on, the light is just right - not too bright but bright enough. I plan on ordering more of them.